It’s not easy to reach the University of Denver and Colorado RTD stations by foot or by bike, which is why Denver Public Works, the University of Denver, Denver Community Planning and Development, and nonprofit Transportation Solutions have been working on a plan to redesign nearby streets. On Tuesday, the group shared the latest version of its conceptual design with the public. The highlights of that blueprint are a road diet and two-way raised bike lane along Buchtel Boulevard, as well as pedestrian upgrades at four car-centric intersections. Those improvements are on the shortlist for funding through the bond measure heading to voters in November. Other pieces of the plan are unfunded, including redesigns of Asbury Avenue and Bellaire Street to prioritize walking and biking. The overall goal is to make walking and biking safer and more appealing options to get to the stations. Right now, streets like I-25, Colorado Boulevard, Evans Avenue, University Boulevard, and Buchtel Boulevard are so dangerous that driving may feel like the only option to many people. Here’s a closer look at the plans for the University and Colorado station areas. Buchtel Boulevard links University of Denver Station to Colorado Station. It’s an important connection on and around the DU campus, but it’s not comfortable to walk or bike. The street is four lanes wide for the most part. Planners want to widen the sidewalks, add a raised two-way bike lane, and trim the traffic lanes down to one in each direction. A parking lane and three-foot buffer will separate people on bikes from traffic. Buchtel has a posted speed limit of 30 mph, but the design speed — how fast drivers go based on cues in the street design — is faster, said Chris Vogelsang, also of OV Consulting. Vogelsang said he’d like to see both the posted speed limit and design speed brought down to at least 25 mph, which the road diet can help achieve. 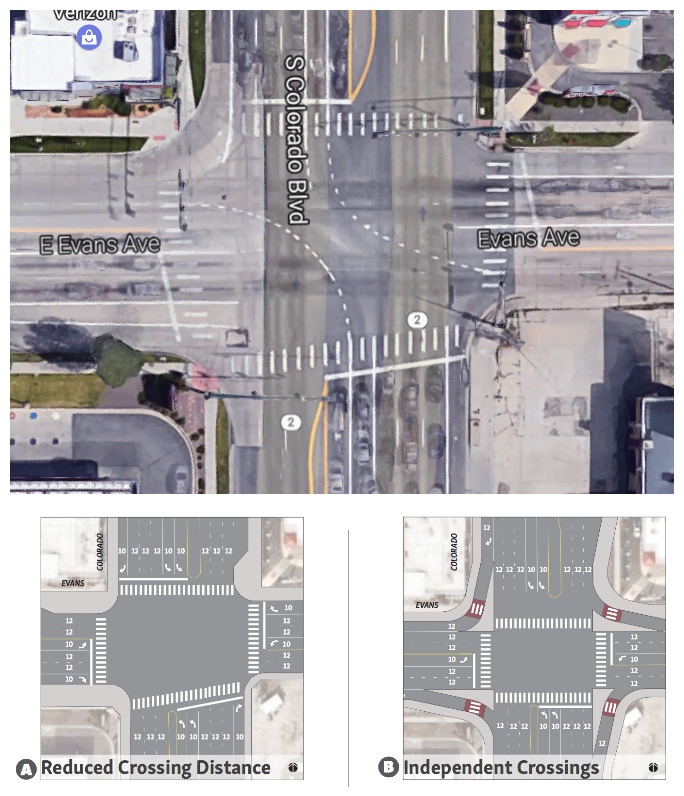 Four gigantic intersections, where one wide street crosses another, are especially dangerous for pedestrians: University and Evans, Colorado and Evans, Colorado and Buchtel, and University and Buchtel. Fixes include narrowing driving lanes, removing turn lanes, adding curb extensions, and building pedestrian islands to shorten crossing distances. Planners also recommend giving pedestrians an exclusive crossing phase at some locations. The pedestrian crossings at University and Evans range from 66 to 77 feet wide. To shrink that distance by to 56 feet at each crossing, planners want to eliminate turn lanes and narrow other travel lanes. Pedestrians would get a crossing phase that starts 3 to 7 seconds before any car gets a green light. Another option that planners are considering for this intersection, however, would only narrow the crossings to 66 feet. Planners are not considering fewer lanes at Evans and Colorado, but they should, given the insane amount of space dedicated to cars here. Instead, they’re looking at two main options: curb extensions and slightly narrower lanes (A) or pedestrian islands break up the extra-long crossings (B). 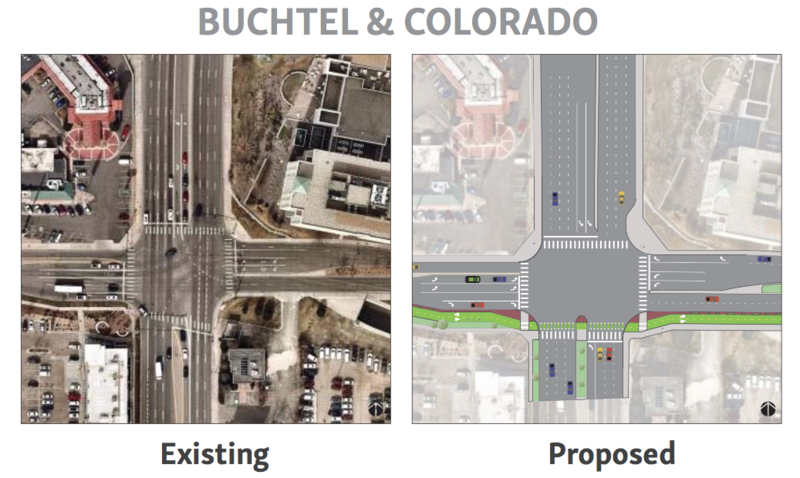 The two-lane road diet proposed for most of Buchtel would get watered down when it hits Colorado Boulevard. Planners would remove just one car lane on the west side of Buchtel at this intersection. Crossing distances that now range between 81 and 121 feet would range between 63 and 114 (so, still huge chasms in some cases). A bulb-out on one corner and a more robust pedestrian island on the south side will shorten crossings and compel turning drivers to slow down. 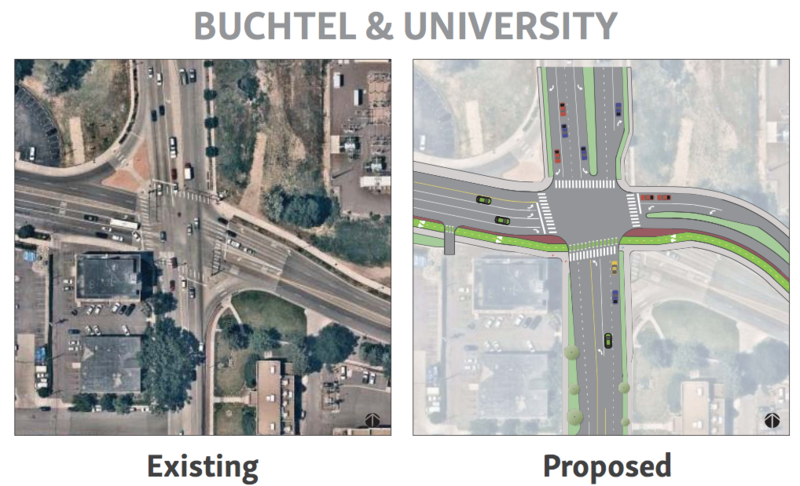 Planners propose a significant road diet for the east side of Buchtel at University, with a much shorter crossing distance. Slip lanes would also be eliminated, creating more cohesive walking and biking paths with fewer potential conflicts with drivers. Crossings that range between 98 and 112 feet would shrink to between 45 and 84 feet, depending on the leg. At both the University and Colorado intersections, pedestrians and bicyclists would get dedicated crossing phases where turning drivers would not have a green light at the same time. Just curious, but I find the bicycle route from Colorado Station to University Station to be one of the fastest areas to ride around Denver on street. With the proposed changes will I still be able to ride 20-25 mph? I even hit 30 mph from University to High St with full commuting gear (two loaded panniers). The design looks to be encouraging C riders to be able to get around the area versus A riders like yourself appear to not have challenges with the current setup. This could get more what I call “interested, but concerned” riders out, which is never a bad thing. As someone who runs and bicycles through the area it’s not bad right now. The problem is that cars use Buchtel to get around traffic that is on I25 and are trying to speed and save time by avoiding I25. The real problem is the pedestrian crossing and ridiculous bicycle route that crosses Birch at Evans. Seriously. There’s still no plan to improve that intersection, and that means no reasonable north-south access for Colorado Station. I am am still pleased that east-west access will likely be a lot better for pedestrians; those intersections are unnecessarily awful, especially being right next to the station. Denver really needs to get serious and have a plan for Evans in that neighborhood. Currently it is a six lane highway between Downing and the University. But it seems like there is a ton of potential to be more than that.